Does Komen Finally Deserve Forgiveness? In a piece for Frugivore, Arielle Loren writes that Susan G. Komen for the Cure wasn't the first organization to make a mistake, and shouldn't be punished forever. She says we should focus again on how much it helps women through breast-cancer research. 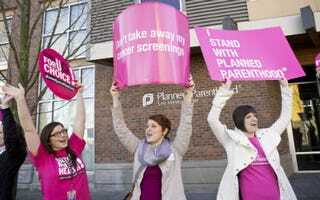 Five high-ranking executives of the Susan G. Komen for the Cure breast cancer foundation have resigned from their positions since the aftermath of the organization’s decision to eliminate its funding for the Planned Parenthood Federation of America (PPFA), which it later reversed and restored. Komen spokesperson Leslie Aun shared the following in response to inquiries about the resignations. Indeed, Komen has invested more than 1.9 billion in breast cancer research and activism. It’s currently the largest grassroots network of breast cancer survivors and activists, working together to save lives, empower people, fight for quality healthcare, and support scientists pursuing breast cancer cures. Point blank, Komen has been there for countless women, many of who were shocked to hear it would even consider defunding Planned Parenthood. But nonetheless, a controversial and unpopular decision doesn’t take away the fact that Komen has empowered and assisted women and families all over the world battling breast cancer. And for that reason alone, perhaps we should consider the path of forgiveness. As Planned Parenthood’s funding stands restored by Komen due to intense supporter and media backlash, there are still large amounts of women battling breast cancer that depend on Komen. I remember when my mother was battling breast cancer before it took her life in 1993. The treatment opportunities are better for contemporary breast cancer fighters compared to options that she had to choose from. And I credit those improvements to organizations like Komen who have relentlessly invested in breast cancer research while empowering those affected by the disease. Read Arielle Loren's entire piece at Frugivore.